He began the campaign with 41 points against Milwaukee on Oct. 17, breaking the franchise record for highest-scoring output in a season opener. Three days later, he notched his 10,000th career point in the team’s road win over Miami, becoming the second member of the 2011 NBA Draft class to reach this milestone. On Nov. 20, Walker exploded for a single-game franchise-record 60 points in an overtime loss to Philadelphia, which came in as the third-highest such total in the NBA this season. He followed it up with a marvelous 43-point showing in a comeback win over the Celtics, becoming just the sixth player in NBA history to score at least 60 and 40 points in consecutive games. Twice this season he tied his own franchise record with 47 points in a road game, the first occurrence of which took place in Washington on Dec. 29. This outing included 24 points in the final 12 minutes of play, the most ever by any Charlotte player in a single quarter. A month after that, Walker sat in a Milwaukee hotel room watching TNT’s live All-Star Game announcement broadcast, which officially confirmed him as a first-time starter for the league’s showcase event. He became the second player in franchise history to make the All-Star Game three times and the first to start it since 2000. Walker, who also participated in the Three-Point Contest for the second time, finished the marquee exhibition with four points and a game-high eight assists. 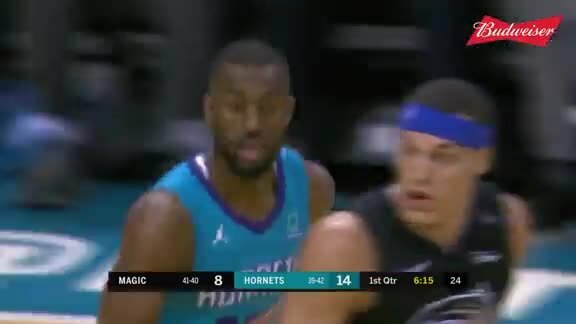 Minus the loss, it was a once-in-a-career night for the Hornets point guard as he took on the role of both host and beloved hometown star all weekend long in the city of Charlotte. 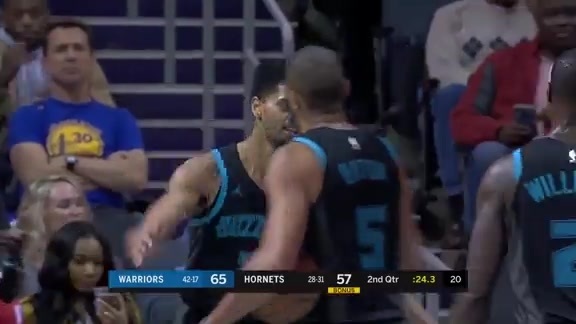 Right after the break, Walker broke another franchise record by knocking Dell Curry off the top rung for most all-time field goals, which came against the latter’s son Steph, and the Golden State Warriors on Feb. 25. He scored 40 points in Houston on March 11, knocking down a team-record six threes without a miss and then scored 47 again in Utah on April 1, setting another organizational high for points in any half (38). One record that narrowly eluded him two years ago, Walker finally surpassed the franchise’s single-season mark for three-pointers with his 244th make in a road win over New Orleans on April 3. This outing was also his second straight game with at least 20 fourth-quarter points, making him the first NBA player to accomplish this feat since Kobe Bryant in 2006. He scored his 2,000th point of the season in a win over Toronto on April 5, joining Glen Rice as the only Hornets to do. His 250th three-pointer of the year came in a road win against Detroit on April 7, making him the ninth different player in league history to reach this figure. The next day, Walker garnered his second NBA Player of the Week Award this season, extending his franchise career record to seven. Much like he started the campaign, Walker closed out the year with a 43-point showing against Orlando, the most by any Charlotte player in any regular season finale. His 2,102 points this year were third most in the league behind only James Harden and Paul George. Walker played all 82 games for the second time in his career, posting personal bests in scoring (25.6 PPG; T-12th in NBA), rebounding (4.4), three-point field goals (260; fifth in NBA), total assists (484) and 30-point games (franchise-record 28). He finished behind only LeBron James and Harden in fourth-quarter scoring (8.0) and was tied for third in 40-point performances (7). He’s also one of just seven NBA players in the last 30 years to average 25.0 PPG and 5.0 APG over all 82 games in a single season, a list that includes Michael Jordan, Allen Iverson, Kobe Bryant, Harden, James and Bradley Beal. Walker and Iverson are the only players 6-1 or shorter to put up these marks minus the games played, while also swiping 1.0 SPG since 1991. Walker now has a very solid case for the exclusive All-NBA team, which hasn’t featured a Charlotte player since 2014. If chosen, he’d be just the sixth different member of the franchise history to receive this accolade, joining Rice, Larry Johnson, Anthony Mason, Eddie Jones and Al Jefferson. 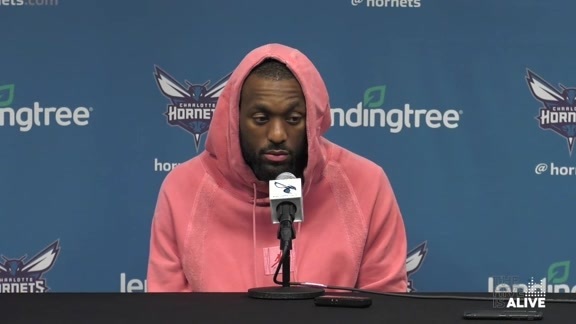 Kemba Walker just finished off the best individual season in team history, further solidifying his status as the greatest player to ever suit up for the Charlotte Hornets organization. Only time will tell if he’ll keep adding to his long list of accomplishments in the purple and teal.